Chargers are one of the five main weapon classifications in Splatoon. The charger has a build-up time to a powerful blast that can take enemies out immediately within a long range. 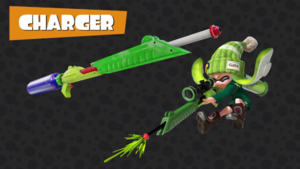 It is an ideal weapon for Inklings on guard, with the option to fire uncharged shots for quicker turf coverage. With the Inkling Girl amiibo, the player can use the Hero Charger for Octo Valley missions to win a Hero Charger Replica. The reticle will turn into an X when it is over an enemy (that's not hiding in ink) inside the charger's range. If an enemy has taken some damage already, a fully charged shot may not be necessary to splat them. If an enemy is closing in or launches a surprise attack, it is a good idea to run away; chargers are weak at close-quarters combat. If cornered, shooting a few well-aimed semi-charged shots at the opposing player may help the user to stay alive. Spamming shots (especially when playing with motion controls) can throw a player's aim off, and, more than likely, the other player may have taken a bit of damage. It's faster to hit them with one well aimed charged shot than multiple un-charged shots. Chargers will show a thin glowing line when aiming a charged shot, revealing one's position. This can make it easier for enemies to dodge, so it is advised to limit the amount of time spent aiming. An effective way around this is to hold the reticle off to a side, and at the last second, quickly move it and fire in order to stop the enemy from dodging the shot. It is also possible to scare opposing teammates into going a different direction by using the laser sight. In Splatoon 2, storing one's charge will make the laser disappear from the sight of other players while a faint, semi-translucent reticle will remain on the user's screen and show where they are aiming. Keeping some distance from the main area where the battle is taking place and finding a comfortable spot to shoot from are necessary to play chargers to the best of their ability. As a result, it is advised to stay out of close-quarters situations, as chargers perform poorly in these scenarios. As a charger user, it is important to have an eye on the surrounding area - sneak attacks are very dangerous. It is best to cover lots of turf around the user so they don't get stuck on un-inked turf in case of a surprise attack. Jumping and shooting can help to level a player's aim in certain situations, allowing them to splat more players. It can also be used to hide the charger's laser sight. Sometimes as a charger, it is best to make short cuts and try not to cover tons of ground. If using a charger, your main focus is to splat people, not cover ground. This way, you get more splats and ground coverage. Let the rollers, sloshers, shooters, and splatlings cover ground. If you must cover ground, don't spam shots to try and cover turf. You'll cover more ground if you wait to charge a shot up and shoot them forward in a straight line. Even with low ink, Chargers can still charge up to a full shot with the same power. If targeted by a charger, moving erratically may cause them to miss. Jumping is a bad tactic to avoid chargers, as changing velocity while jumping is really hard and usually leads to the charger user getting an easy splat. A charger's weakest spots are behind them and beneath them; surprising them from an unexpected angle is almost a guaranteed splat. Closing in on chargers quickly gives them little time to react. Forcing a charger user out of their chosen position and into one where they are vulnerable is a great way to give a player the advantage over chargers. One way to do this is to stay just out of their range or line of sight, forcing them to give chase. Another way is through the use of special weapons, such as the Inkstrike and the Killer Wail, which, when directed at their chosen spot, will either catch them by surprise or make them move out of the way. In the case of attentive chargers that are good at dodging special weapons and foiling sneak attacks, another option is to simply avoid them. Go ink a different area, one that they are not paying attention to. In Splatoon 2, if you see a glowing, white circle inside enemy ink it is advised to stay hidden, as the glowing, white circle is an enemy charger that is currently storing their charge and they may be trying to splat you or one of your teammates. There are no chargers with the Seeker as their sub weapon. Inklings will close one eye when aiming with a charger. The Custom E-liter 3K Scope. The Bamboozler 14 Mk I. The Bamboozler 14 Mk II. The Bamboozler 14 Mk III. This page was last edited on 3 April 2019, at 10:14. This page has been accessed 61,613 times.